David Dean Rusk (February 9, 1909 – December 20, 1994) was the United States Secretary of State from 1961 to 1969 under presidents John F. Kennedy and Lyndon B. Johnson. Rusk is one of the longest serving U.S. Secretaries of State, behind only Cordell Hull. Born in Cherokee County, Georgia, Rusk taught at Mills College after graduating from Davidson College. During World War II, Rusk served as a staff officer in the China Burma India Theater. He was hired by the United States Department of State in 1945 and became Assistant Secretary of State for Far Eastern Affairs in 1950. In 1952, Rusk became president of the Rockefeller Foundation. After winning the 1960 presidential election, Kennedy asked Rusk to serve as Secretary of State. He supported diplomatic efforts during the Cuban Missile Crisis and, though he initially expressed doubts about the escalation of the U.S. role in the Vietnam War, became known as one of its strongest supporters. Rusk served for the duration of the Kennedy and Johnson administrations before retiring from public office in 1969. After leaving office, he taught international relations at the University of Georgia School of Law. David Dean Rusk was born in a rural district of Cherokee County, Georgia, to Robert Hugh Rusk and Frances Elizabeth (née Clotfelter) Rusk. He was educated in Atlanta's public schools, graduated from Boys High School in 1925, and spent two years working for an Atlanta lawyer before working his way through Davidson College. Rusk was coached in football by William "Monk" Younger and was a member of the Kappa Alpha Order Sigma chapter, and the national military honor society Scabbard and Blade becoming a Cadet Lieutenant Colonel commanding the Reserve Officers' Training Corps battalion. He graduated Phi Beta Kappa in 1931. While studying in England as a Rhodes Scholar at St. John's College, Oxford, he received the Cecil Peace Prize in 1933. Rusk married the former Virginia Foisie (October 5, 1915 – February 24, 1996) on June 9, 1937. They had three children: David, Richard, and Peggy Rusk. Rusk taught at Mills College in Oakland, California, from 1934 to 1949, and he earned an LL.B. degree at the University of California, Berkeley in 1940. During World War II, Rusk joined the infantry as a reserve captain and served as a staff officer in the China Burma India Theater. At war's end he was a colonel, decorated with the Legion of Merit with Oak Leaf Cluster. Rusk returned to America to work briefly for the War Department in Washington. He joined the Department of State in February 1945, and worked for the office of United Nations Affairs. In the same year, he suggested splitting Korea into spheres of U.S. and of Soviet influence at the 38th parallel north. After Alger Hiss left State in January 1947, Rusk succeeded him (as Director of the Office of Special Political Affairs), according to Max Lowenthal. In 1949, he was made Deputy Under Secretary of State. In 1950, Rusk was made Assistant Secretary of State for Far Eastern Affairs. He played an influential part in the US decision to become involved in the Korean War, and in Japan's postwar compensation for victorious countries, such as the Rusk documents. Rusk was a cautious diplomat and always sought international support. Rusk and his family moved to Scarsdale, New York, while he served as a Rockefeller Foundation trustee from 1950 to 1961. In 1952 he succeeded Chester L. Barnard as president of the foundation. On December 12, 1960, Democratic President-elect John F. Kennedy nominated Rusk to be Secretary of State. According to historian and former Special Assistant to President Kennedy Arthur Schlesinger Jr., Rusk was not Kennedy's first choice, but rather the "lowest common denominator", as Kennedy's first choice, J. William Fulbright, proved too controversial. David Halberstam also described Rusk as "everybody's number two". Rusk was sworn in on January 21, 1961. On March 24, 1961, Rusk released a brief statement saying his delegation was to travel to Bangkok and the SEATO nations' responsibility should be considered if peace settlements were not realized. As he recalled in his autobiography, As I Saw It, Rusk did not have a good relationship with President Kennedy. The president was often irritated by Rusk's reticence in advisory sessions and felt that the State Department was "like a bowl of jelly" and that it "never comes up with any new ideas". Special Counsel to the President Ted Sorensen believed that Kennedy, being well versed and practiced in foreign affairs, acted as his own Secretary of State. Sorensen also said that the president often expressed impatience with Rusk and felt him under-prepared for emergency meetings and crises. Rusk repeatedly offered his resignation, but it was never accepted. Rumors of Rusk's dismissal leading up to the 1964 election abounded prior to President Kennedy's trip to Dallas in 1963. Shortly after Kennedy was assassinated, Rusk offered his resignation to the new president, Lyndon B. Johnson. However, Johnson refused Rusk's resignation and retained him as the Secretary of State throughout his administration. November 23, 1963, the day after JFK's assassination, Rusk said the US had "much unfinished business" and offered praises for both the late President Kennedy and LBJ while speaking at Andrews Air Force Base in Washington. When Lyndon B. Johnson died in 1973, Rusk eulogized the former President when he lay in state. On August 29, 1964, amid the ongoing presidential election, Rusk called for bipartisan support to ensure that the US's foreign policy have both consistency and reliability and said Republican presidential nominee Barry Goldwater was creating "mischief". The following month, at a September 10 press conference in the main auditorium of the State Department, Rusk said that Senator Goldwater's critiques "reflect a basic lack of understanding" of a U.S. President's handling of conflict and peace. On September 21, Rusk said the US would not be pushed out of the Gulf of Tonkin and that the prevention of it becoming a "communist lake" would be assured by the continued presence of American forces there. On March 19, 1965, Rusk commented that Russia was appearing "disinclined to put its full weight behind" international agreements on Vietnam and Laos during a press conference. On April 18, 1967, during a speech in Washington in regards to ending the conflict in South Vietnam, Rusk said the United States was prepared to "take steps to deescalate the conflict whenever we are assured that the north will take appropriate corresponding steps." Rusk offered or planned to offer to resign in the summer of 1967, because "his daughter planned to marry a black classmate at Stanford University, and he could not impose such a political burden on the president" after it became known that his daughter, Peggy, planned to marry Guy Smith, "a black Georgetown grad working at NASA". In fact, the Richmond News Leader stated that it found the wedding offensive, further saying that "anything which diminishes [Rusk's] personal acceptability is an affair of state". He decided not to resign after talking first to Robert S. McNamara and Lyndon Johnson. A year after his daughter's wedding, Rusk was invited to join the faculty of the University of Georgia Law School, only to have his appointment denounced by Roy Harris, an ally of Alabama Governor George Wallace and a member of the university's board of regents, who stated that his opposition was because of Peggy Rusk's interracial marriage. The university nonetheless appointed Rusk to the position. On January 5, 1968, notes by Rusk were delivered to Ambassador of the Soviet Union to the United States Anatoly Dobrynin, pleading support from the US to "avoid recurrence of" claimed bombing of Russian cargo ships in the Haiphong North Vietnam port the day prior. On February 9, Rusk was asked by Senator William Fulbright over his possible information in regards to a US tactical nuclear weapons introduction in South Vietnam report. On April 17, during an American Society of Newspaper Editors luncheon meeting, Rusk admitted that the United States has taken "some lumps" propaganda wise but the Johnson administration should persist in trying to find a location of neutrality for the peace talks to occur. The following day, Rusk added 10 sites to the 5 proposed initially, accusing Hanoi of having a propaganda battle over neutral areas for discussion during a press conference. On June 26, Rusk assured Berlin citizens that the United States along with its North Atlantic Treaty partners were "determined" in securing Berlin's liberty and security, additionally criticizing the recent travel restrictions of East Germany as violating "long standing agreements and practice." On September 30, Rusk met privately with Foreign Minister of Israel Abba Eban in New York City for discussion on peace plans from the Middle East. On November 1, Rusk said long term allies of the North Vietnam bomb halt should pressure Hanoi to accelerate their involvement in the peace talks in Paris. On December 1, citing the halt of bombing in North Vietnam, Rusk said that the Soviet Union would need to come forward and do what it could to forward peace talks in southeast Asia. On December 22, Rusk appeared on television to officially confirm the 82 surviving crew members of the Pueblo intelligence ship, speaking on behalf of the hospitalized President Johnson. January 2, Rusk met with five Jewish American leaders in his office to assure them the US had not changed its policy in the Middle East recognizing the sovereignty of Israel, one of the leaders, the American-Israeli Public Affairs committee's Irving Kane, saying afterward that Rusk had successfully convinced him. 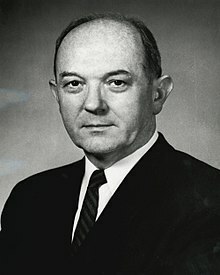 On July 27, 1969, Rusk voiced his support for the Nixon administration's proposed anti-ballistic missile system, saying that he would vote for it, were he a senator, from an understanding that further proposals would be reviewed if any progress would be made in Soviet Union peace talks. The same year, Rusk received both the Sylvanus Thayer Award and the Presidential Medal of Freedom, with Distinction. Following his retirement, he taught international law at the University of Georgia School of Law in Athens, Georgia (1970–1984). he died of heart failure in Athens, Georgia on December 20, 1994, at the age of 85. He and his wife are buried at the Oconee Hill Cemetery in Athens. Actor Henry Strozier played Secretary Rusk in Thirteen Days, a 2000 American historical political thriller film directed by Roger Donaldson, dramatizing the Cuban Missile Crisis of 1962. ^ MORRISON, DONALD (1990-07-30). "Ghost Dad (bk rvw of AS I SAW IT by Dean Rusk, as told to Richard Rusk)". Time. Retrieved 2008-02-04. I won't be around for history's verdict," says Rusk, now 81 and ailing in his Georgia retirement, "and I am perfectly relaxed about it. ^ a b c d e f g Anonymous. "Biography of Dean Rusk". Davidson College. Retrieved 2008-02-03. ^ "Famed Fraternity Members". Kappa Alpha Order. Archived from the original on 2008-05-09. Retrieved 2008-02-03. ^ Turner, Arthur Campbell; Francis Carney; Jan Erickson (2005-04-05). "Transcription of Oral History Audio Interview with ARTHUR CAMPBELL TURNER April 6 and May 28, 1998" (PDF). University of California, Riverside. p. 8. Retrieved 2008-02-03. ^ "Parks Rusk Collection of Dean Rusk Papers". Richard B. Russell Library for Political Research and Studies. University of Georgia. pp. Biographical Note. Archived from the original on May 17, 2008. Retrieved 2008-02-04. ^ Schlesinger Jr., Arthur M. (2008). Journals 1952-2000. Penguin Books. p. 98. ISBN 978-0-14-311435-2. Elizabeth Farmer told me this evening that, at five this afternoon, it looked as if it would be Rusk in State, with Bowles and Bundy as Undersecretaries. (Ken, by the way, told me that Jack had called him on the 7th and talked seriously about Mac as Secretary.) I asked why Rusk had finally emerged. Elizabeth said, 'He was the lowest common denominator.' Apparently Harris Wofford succeeded in stirring the Negroes and Jews up so effectively that the uproar killed Fulbright, who was apparently Jack's first choice. ^ Halberstam, David (1972). The Best and the Brightest. Random House. p. 32. ISBN 0-394-46163-0. ^ Averting the Final Failure: John F. Kennedy and the Secret Cuban Missile Crisis Meetings, by Sheldon M. Stern, Stanford University Press, 2003, p. 80. ^ Henry II, John B.; William Espinosa (Autumn 1972). "The Tragedy of Dean Rusk". Foreign Policy. Carnegie Endowment for International Peace (8): 166–189. doi:10.2307/1147824. JSTOR 1147824. ^ "DEAN RUSK WARNS OF LAOS DANGERS; ON WAY TO SEATO". Chicago Tribune. March 24, 1961. ^ Sorensen, Ted (2008). Counselor: A Life At The Edge Of History. HarperCollins. pp. 233–234. ISBN 978-0-06-079871-0. President Kennedy was less satisfied with his secretary of state, Dean Rusk...John F. Kennedy, more than any president since FDR, was his own secretary of state...But it was not the White House staff that said the State Department was 'like a bowl of jelly', or that it 'never comes up with any new ideas'. Those were John F. Kennedy's words...More than one White House tape revealed the president's impatience with Rusk...nor did JFK or RFK believe that Rusk himself was as thoroughly prepared for emergency meetings and crises as he should have been. ^ "Rusk Praises Johnson; 6 in Cabinet Back". Chicago Tribune. November 23, 1963. ^ "Rusk Assails Barry's Hot Line Charges". Chicago Tribune. August 30, 1964. ^ "Barry's Blasts Foolish, Rusk Charges". Chicago Tribune. September 11, 1964. ^ Korman, Seymour (September 22, 1964). "Reds Can't Push U.S. from Gulf, Rusk Says". Chicago Tribune. ^ "Russia Fails To Back Viet Pacts - Rusk". Chicago Tribune. March 20, 1965. ^ Ogden, Christopher (1995-09-18). "Bombs Away!". Time. 146 (12). pp. 166–189. Retrieved 2009-02-11. ^ "Andrew Roberts addresses The Bruges Group". The Bruges Group. Archived from the original on 2009-07-22. Retrieved 2009-02-11. ^ Schoenbaum, Thomas J. (1988). Waging Peace and War: Dean Rusk in the Truman, Kennedy, and Johnson Years. Ann Arbor, Michigan: Simon & Schuster. p. 421. ISBN 0-671-60351-5. ^ King, William (April 19, 1967). "Rusk Again Asks Hanoi to Move for Peace". Chicago Tribune. ^ Rick, Frank (November 2, 2006). "Guess Who's Coming to Dinner". The New York Times. p. W-10. ^ McNamara, Robert S. (1995). In Retrospect: The Tragedy and Lessons of Vietnam. Random House. p. 282. ISBN 0-8129-2523-8. It may be hard for readers today to understand what went through his mind. But it was very clear to me at the time: he believed that because he was a southerner, working for a southern president, such a marriage – if he did not resign or stop it – would bring down immense criticism on both him and the president. .... [T]he president reacted as I expected – with congratulations for the impending marriage. So far as I was aware, the marriage had absolutely no effect – political or personal – on Dean or the president. ^ "Rush Assured By US In Bomb Raid Charges". Chicago Tribune. January 5, 1968. ^ "Rusk Is Quizzed". Chicago Tribune. February 9, 1968. ^ Freeburg, Russell (April 17, 1968). "Hanoi Warned By Rusk: Don't Wreck Hopes". Chicago Tribune. ^ Yuenger, James (April 18, 1968). "Rusk Names 4 In Europe And 6 In Asia". Chicago Tribune. ^ Siegert, Alice (June 26, 1968). "Berlin Shall Remain Free, Rusk Pledges". Chicago Tribune. ^ Fulton, William (September 30, 1968). "Rusk, Israeli Confer; Deny Mid-East Plan". Chicago Tribune. ^ Yuenger, James. "Rusk Asks Aid To Push Hanoi Toward Peace". Chicago Tribune. ^ Kling, William (December 1, 1968). "Rusk Urges Soviet Peace Role". Chicago Tribune. ^ "Rusk Breaks Pueblo News on Television". Chicago Tribune. December 22, 1968. ^ Yuenger, James (January 2, 1969). "Arab Recognition of Israel Still U.S. Goal, Says Rusk". Chicago Tribune. ^ Jones, William (July 27, 1969). "Rusk Backs ABM, Hails Peace Work". Chicago Tribune. Cohen, Warren I. Dean Rusk (1980). Nuenlist, Christian. "The quiet man: Dean Rusk and Western Europe." Journal of Transatlantic Studies 6.3 (2008): 263-278. Schoenbaum, Thomas J. Waging Peace and War: Dean Rusk in the Truman, Kennedy, and Johnson Years (1988). Snyder, William P. "Dean Rusk to John Foster Dulles, May–June 1953: The Office, the First 100 Days, and Red China." Diplomatic History 7.1 (1983): 79-86. Stupak, Ronald J. "Dean Rusk on international relations: An analysis of his philosophical perceptions." Australian Outlook 25.1 (1971): 13-28. Zeiler, Thomas W. Dean Rusk: Defending the American Mission Abroad (2000). Dean Rusk, and Ernest K. Lindley. Winds of Freedom-Selections from the Speeches and Statements of Secretary of State Dean Rusk, January 1961-August 1962 (1963). Sully, François, "Dean Rusk with General Khanh, Harkins and Wheeler and Lodge touring Vietnamese highlands." (photo/caption), April 1964; copyright Healey Library, UMass Boston; via openvault.wgbh.org. "Dean Rusk". Find a Grave. Retrieved 2008-02-05. This page was last edited on 13 April 2019, at 23:42 (UTC).